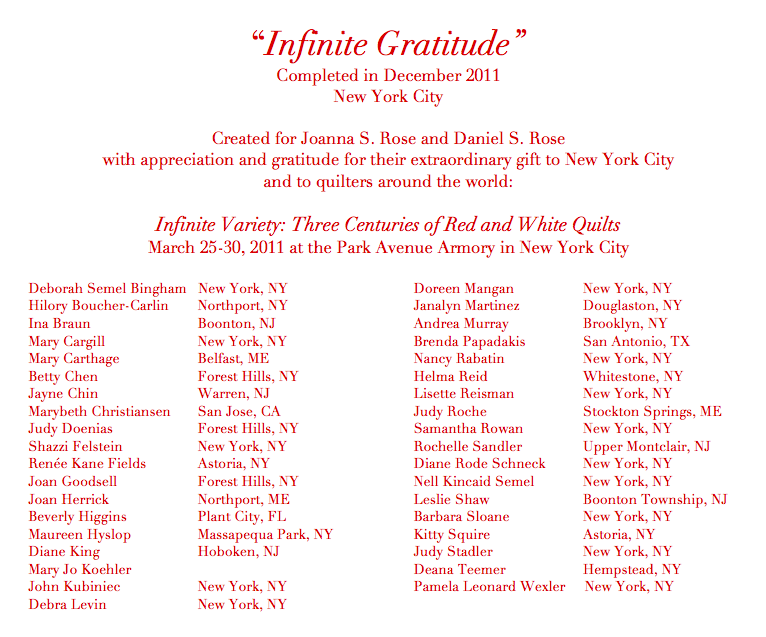 This blog was begun in April 2011 to provide progress updates to all the quilters working on what ultimately became the Infinite Gratitude Quilt in appreciation of Joanna and Daniel Rose’s gift of the Infinite Variety quilt show in New York City in March 2011. To read the posts for the time frame when the quilt was underway, please see the months of April – December 2011. Since the Infinite Gratitude quilt was finished and presented, the Threadmistress blog has been my personal quilting blog. Many of us who worked on the IG quilt still meet regularly to quilt and catch up. We are not a guild, but we met through our shared interest in the Jane Stickle and Dear Jane quilts, and more specifically through the Dear Jane quilt class at the City Quilter shop in New York City.